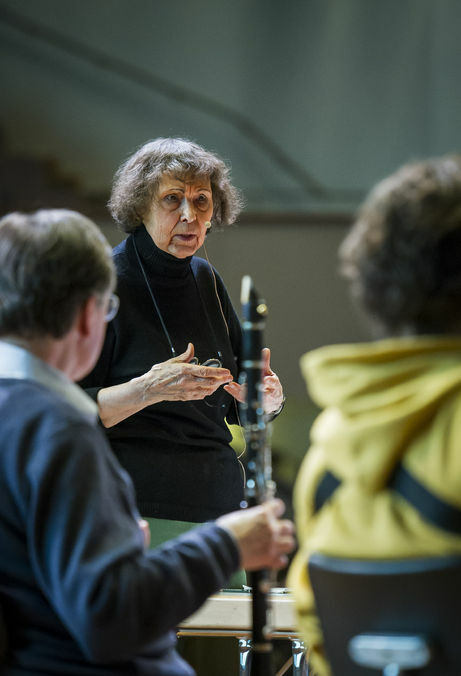 The Bergen International Festival (May 23 through June 6, 2018) presents Sofia Gubaidulina as festival composer and artist in residence this year. Only in 2017 was the Finnish composer Kaija Saariaho in the focus of the festival as part of a three-year composer cycle. Something similar is planned for Unsuk Chin next year. The program of the Bergen International Festival 2018 includes three of Sofia Gubaidulina's main works: "Fachwerk" with the bayanist Geir Draugsvoll and the Kremerata Baltica on May 25, "Sonnengesang" with Andreas Brantelid and the Domchor Bergen and the violin concerto "Offertorium" with Gidon Kremer and the Philharmonic Orchestra Bergen under the direction of Edward Gardner on 27 May. Alice Di Piazza Gubaidulina's Chaconne for Piano and Ivan Monighetti will play the Ten Etudes for Violoncello in a chamber concert on May 28th. Accompanying the festival in the Western Norwegian metropolis, the dedicated performer of Gubaidulina's works, accordionist and bayanist Geir Draugsvoll, invited the composer to a special concert on 29 May in the village of Voss near Bergen. Other contributors to this concert are Ida Løvli Hidle (accordion), Øyvind Gimse (cello) and Geir Inge Lotsberg (violin). The program includes Gubaidulina's compositions "De profundis" for bayan solo, "In croce" for violoncello and bayan, "Et exspecto" for bayan solo and "Silenzio". Five pieces for bayan, violin and cello.